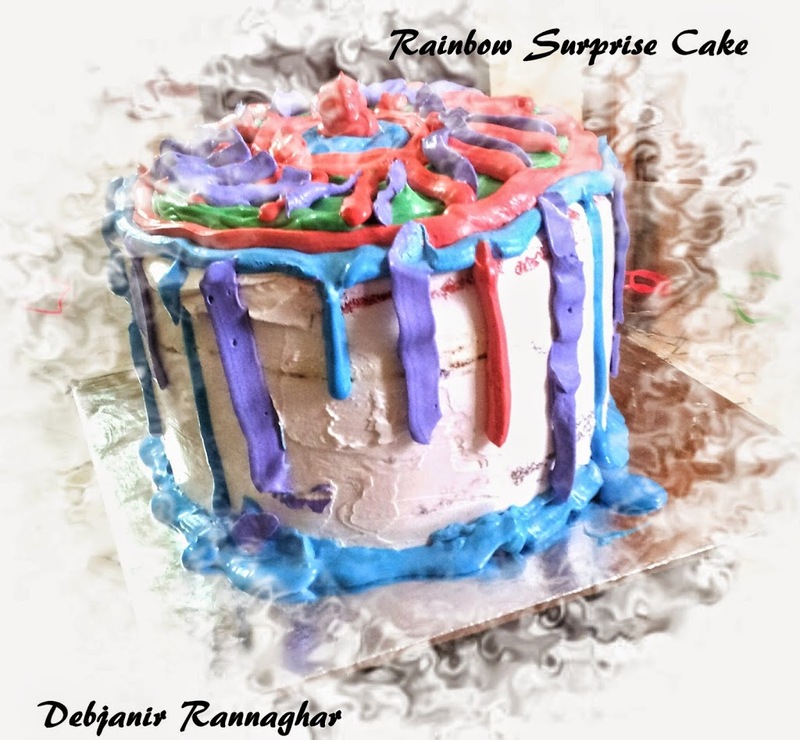 My first attempt with icing and cake decoration and that too for my daughter’s first birthday … I always love rainbow cake for its vibrant colours so I decided to prepare it for Pasta’s birthday but Mehebub was not at all happy with the decision as he’s not confident with my cake making skills …It took me around 5 hours in total to make this Rainbow Surprise Cake and everybody liked it! Preheat the oven in 140 degree C .
Take a 8” cake pan and coat it with butter and dust it with all purpose flour and by this way prepare other 8” cake pans too as you have to prepare 5 cakes separately. I have two cake tin available with so prepared my cakes one by one. Mix All Purpose Flour, Baking Powder and salt in a mixing bowl and keep it aside. Take another bowl and beat unsalted butter in low speed and start to add castor sugar . Don't add entire sugar to the mixture instead add 1 tbsp at a time and then beat and then again add sugar and beat in low speed until the mixture resembles fine dump sand. Now add eggs to the mixture one at a time and beat again. Now add the flour mixture and beat again and add vanilla extract and finally milk and the beat in medium speed for 30-40 seconds to get a semi-thing cake batter. Next, Divide the mixture into 6 bowls (you should have equally divided mixture). 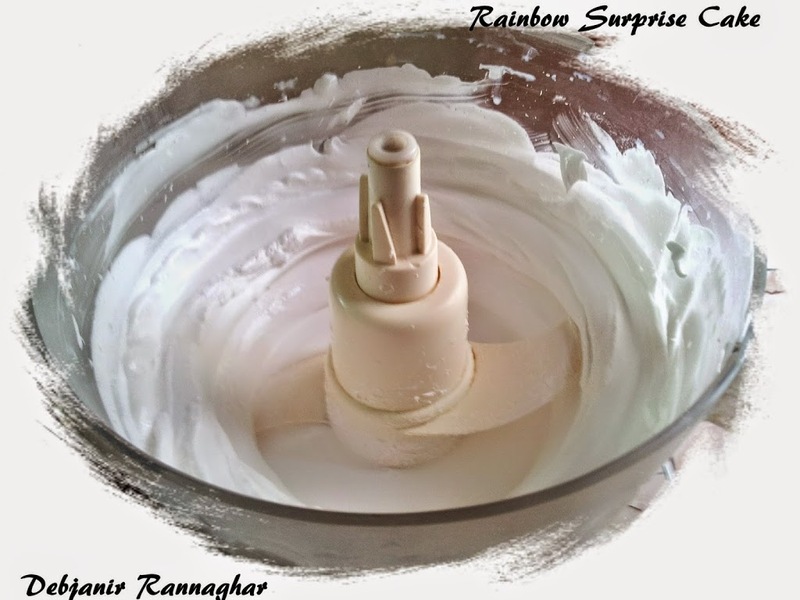 Take one colour and put 2-3 drops ( I have used gel based colour ) in one bowl and mix properly with a spoon ; keep adding and mixing colour until you get the vibrant shed that you want in your cake. 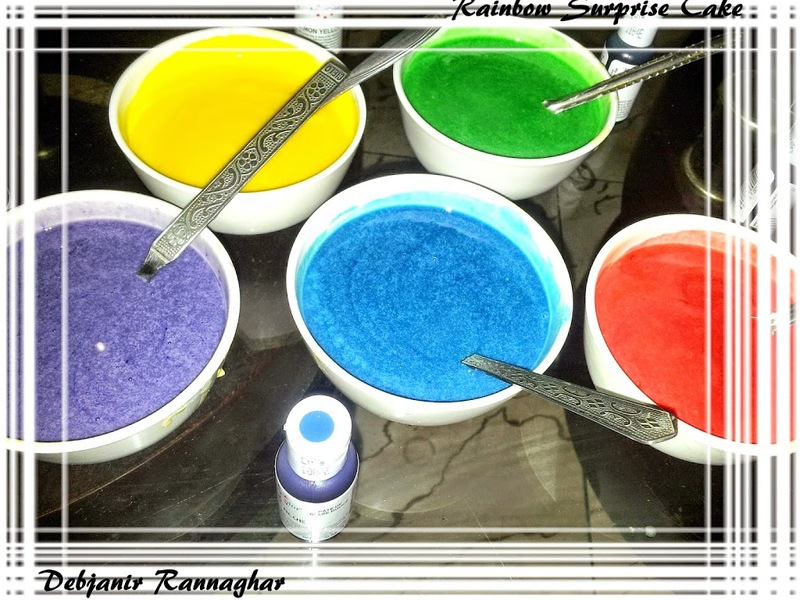 Do the same with other colours and get 6 bowls of different coloured cake mix. I’ve prepared 1 bowl each Red, Yellow, Green, Violet, Turquoise and Blue cake batter. Don’t use same spoon for mixing. It’s better to have 6 separate spoons as well. 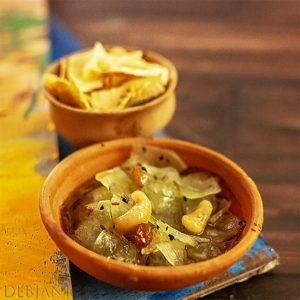 Transfer the mixture of a bowl to a cake tin and try to spread and smooth as much as possible and refrigerate other bowls. Bake the cake in pre-heated oven for 18-20 minutes or until the cake springs back when touching in the middle. Take the cake out of the oven and let it cool in a wire rack for around 10 minutes and demould after that. Bake other cakes with the same process mentioned above. Refrigerate the instant icing before using it. Take the icing in a mixing bowl and beat for around 10 minutes or till the icing turns fluffy and light with a help of a beater. Separate 1/5th of the icing in a bowl for garnishing and rest in another bowl and refrigerate immediately. Take a cake plate and put a little cream in the middle of the plate and place the lower layer of the cake. In my case it’s the blue one. Now put some cream on the top of the blue cake and spread using a cake spatula and place the next layer of the cake which is turquoise in my version. Now take the next piece which’ll be the middle layer and make a hole in the middle using a cookie cutter ( this layer can be prepared using a semi hole cake tin instead of a normal round tin ). 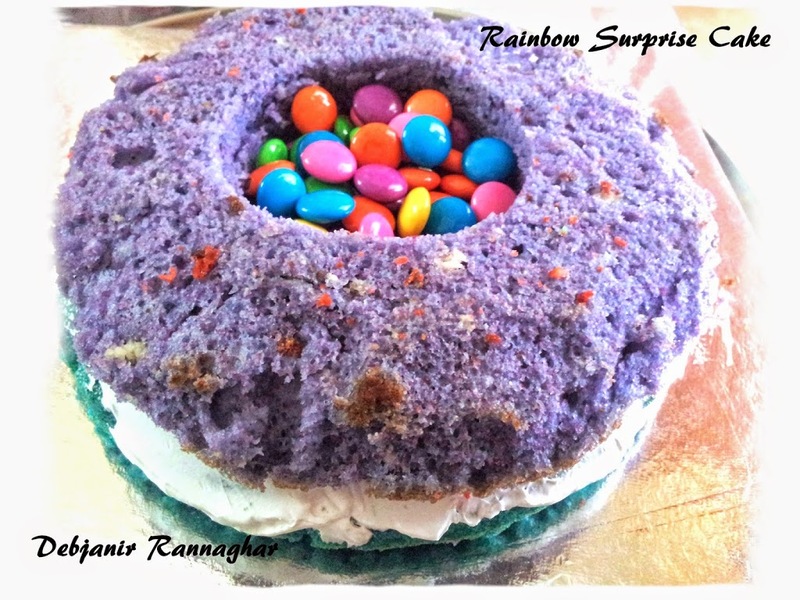 Put some cream on the top of the 2nd layer of the cake and spread it and place the holed layer. 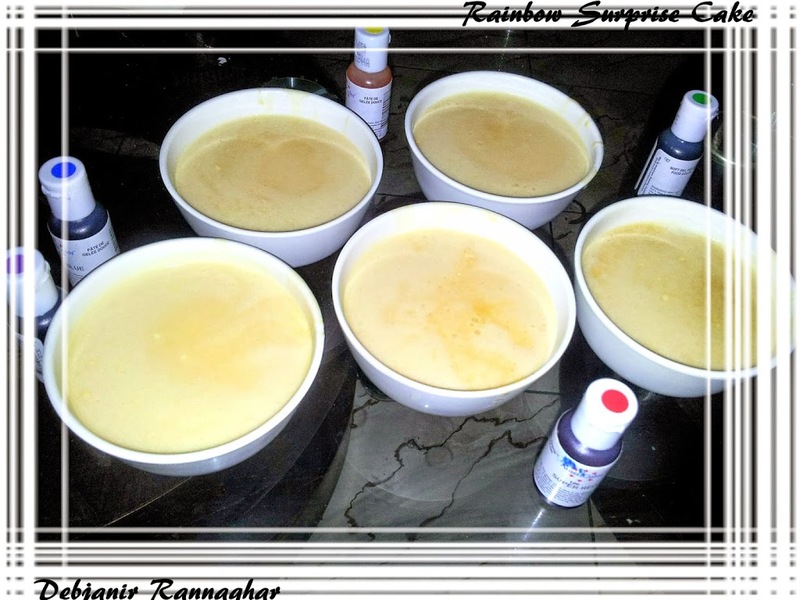 Now fill the hole with 3 packets of Gems chocolate and again put some cream on the top of this level also and spread properly. Now put the yellow cake and place it properly and again put the cream and after spreading place the last level which is the red cake in my version. While assembling the cake just try to place each level with care. Now spread icing all over the side and top of the cake and try to cover any gap between the layers and refrigerate for about one hour. Apply a second layer of coat after one hour and again refrigerate. If required, a third layer can also be applied. 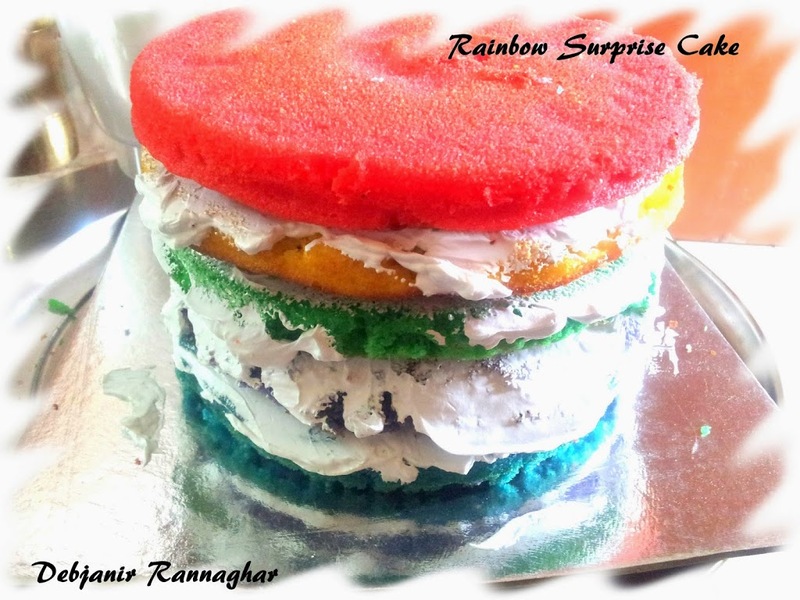 Divide the icing kept for decoration into few parts and mix each part with your colour of choice and decorate the cake. 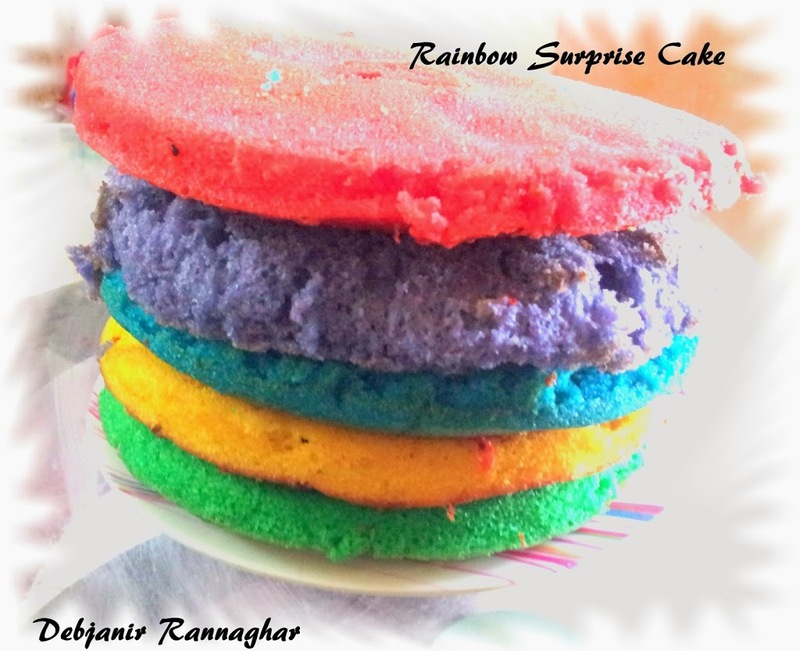 Rainbow Surprise cake is ready for the party!!!!! If not available instead of instant icing homemade frosting can be used. 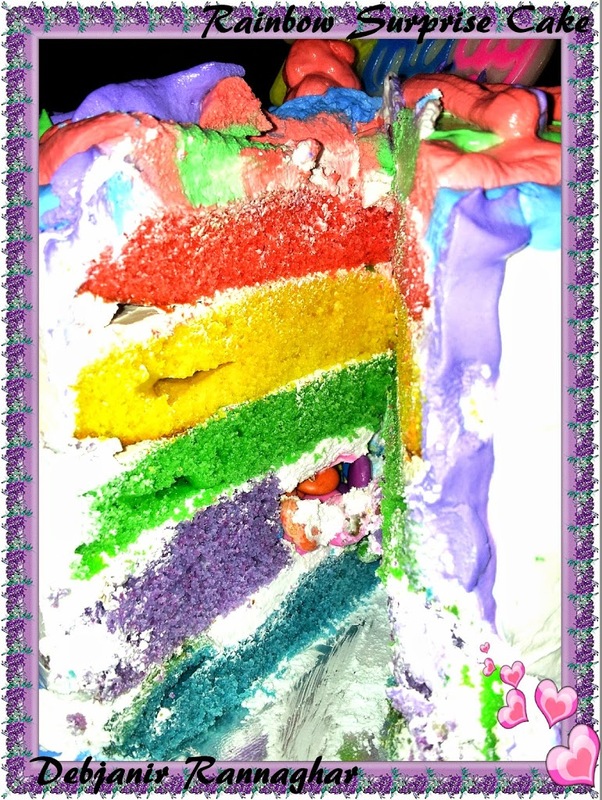 It’s always better to use Gel colors instead of powder colours to get perfect cplour in the cake.